The program is updated. Please check the "Program" page. The program detail is uploaded. Please check the "Program" page. Since the number of workshop participants has reached the maximum capacity, we are no longer accepting applications. The quest for new materials is never-ending, and the development of inorganic materials in particular promises to make possible new technologies that solve many contemporary problems. Bringing together leading solid-state chemists from a wide range of subfields to discuss their latest findings is a vital step in sewing the seeds of new discoveries and ensuring that progress is made in as timely a fashion as possible. 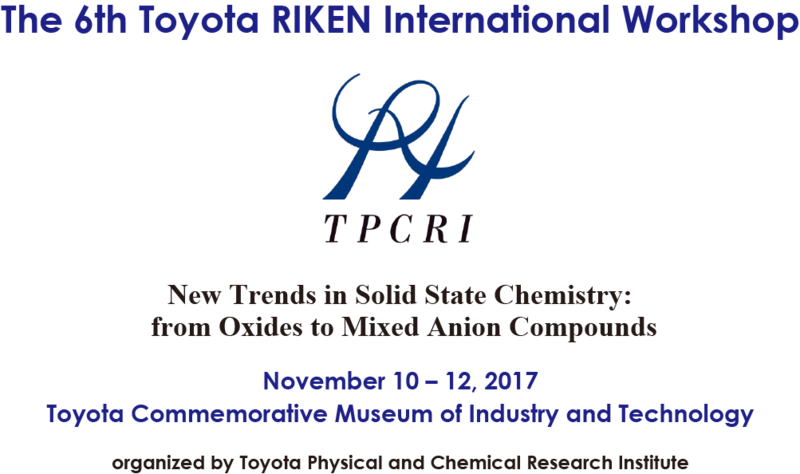 This meeting aims to foster such developments by focusing on new trends in inorganic materials research, from mono-anionic systems such as oxides and nitrides to mixed anion systems such as oxynitrides, oxyfluorides, and oxyhydrides. The range of properties exhibited by these materials, as well as their uses, is vast, encompassing magnetism, superconductivity, energy storage, catalysis, sensing and so on, and this will be reflected in the variety of topics covered by the symposium. Importantly, the meeting will also serve as a forum for discussing future directions for inorganic materials research. Grant-in-Aid for Scientific Research on Innovative Areas "Synthesis of Mixed Anion Compounds toward Novel Functionalities"